I don’t (really) believe in fate but sometimes life has a funny way of reminding you of exactly where you are. I’ve been out on the bike with all the gear on a fair bit recently, replicating what I will do when I leave, to quieten the demons in my mind that say ‘your body can’t do this’. The simplest way to stop that anxiety about something is just to go out and do it. Once it’s done I can move on to the next item. I have a number of routes I cycle from my front door, I do them back to front, the wrong way round, basically to stop myself from getting bored with the same routine. Not once on any of the rides for the last month have I stopped to get the camera out, let alone to take a picture of myself. On Thursday, I was on my last ride before I leave for real. I stopped somewhere I have never stopped before, took the camera out, set it up on the mini tripod and took a couple of shots of myself and the bike. I fiddled with the settings to try to get a slightly moody shot because the light lent itself to it. When I got one I liked I suddenly noticed the graffiti on the wall to my right hand side. I like to think it was a nod to the end of my preparations and it is now time to begin. Of course it means whatever you want it to mean, the same with anything in life, you use your environment to validate your thoughts. The hardest thing in life I find is always to begin. To take the decision at the fork in the road, rather than sit and look at the map for a little longer. It’s easy to sit and procrastinate, to remain comfortable, to exist, to dream instead of act. When it boils down to it that is not enough for me. There is a piece of me missing without a challenge, that is where I get my drive from. I need to search out new experiences to feel alive. To push my boundaries and find my comfort line and step over it. Sometimes I hate myself for it, as all is not rosy on the other side. However If you asked me to choose between being comfortable and existing or amazing highs and crushing lows I’ll take the latter. I’m just wired that way. 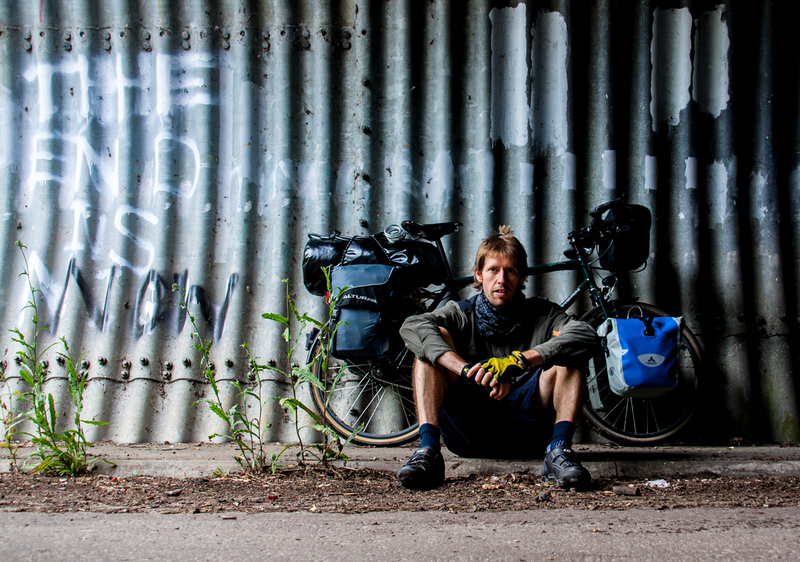 This trip began in my head around two years ago after discovering people are out there riding bikes across continents. To me this was utterly amazing but totally impossible for somebody like me to do. Tomorrow, my impossible becomes my reality. I’ve won before I’ve even begun. There are numerous people, some I know, others strangers but with kindred spirits, whose words have helped me get where I am. I’ve tried to thank them personally, I hope I have, I am not an island. One of the main aims of having this site is to encourage others to go do what excites you, as that is where I believe the real juice of life is. I’m about to find out if I like the taste of my own juice…..
All the best, hope it all works out well for you, enjoy! There is no better high than the moment you are about to jump off a cliff to pursue the dream you have been preparing for! Have fun and stay safe! Iain – YES! This is amazing! What a journey you have ahead of you! Remember that although you will be on the bike alone, you have a huge team of supporters behind you! Thanks Ian, I’m counting on it! Whilst Smudger’s “Samba Cycle” was a big ask, your adventure truly WILL BE epic! Take care and keep me updated on your progress. very different journeys, absolutely no way I could have done what Andy did (and raise over £5k for charity). Thanks for that and congratulations on the swim, no way I could have done that either!!! Hi. I found out about your journey on the smudgersambacycle site. I like to ride my bike too but for me, when i ride 40km i already think that´s a lot! lol. I liked to follow the progress of Andy and i think it´ll be good to follow yours too. Wish you the best! It’s great you want to follow my journey and I’ll let you into a secret, 40km is about all I’m doing a day to start with! I’m taking it easy, and day by day I will slowly move towards my objective. thanks Tanith, I’m planning to hold on tight and see where it takes me!